Meeple War is a free-for-all melee on an uncharted battlefield between different tribes of meeples, as the name indicates. Everyone starts in the same position, but build order, lucky discoveries and specially cold-hearted betrayal in impromptu alliances will decide who is the victor. What is Meeple War like? 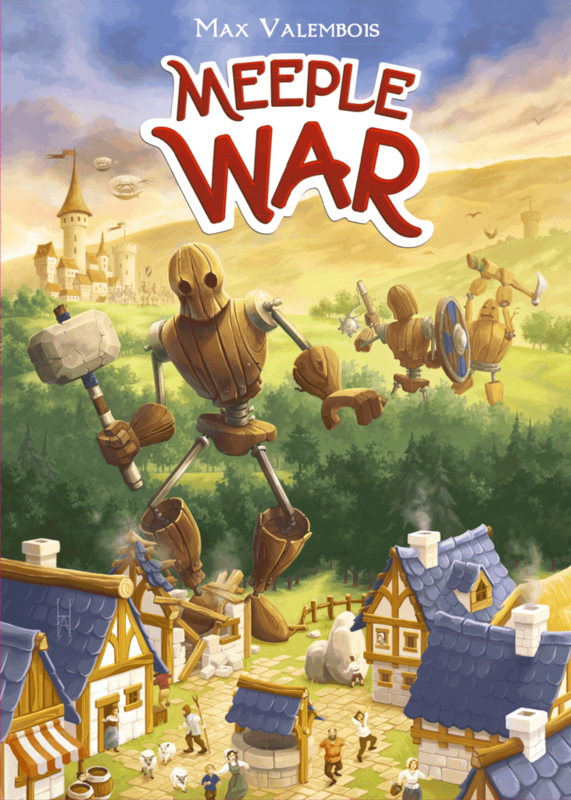 In Meeple War, players take control of a tribe and try to accumulate the most victory points either by destroy enemy meeples or buildings. The only difference between tribes is the color, as they all have access to the exact same buildings and actions. 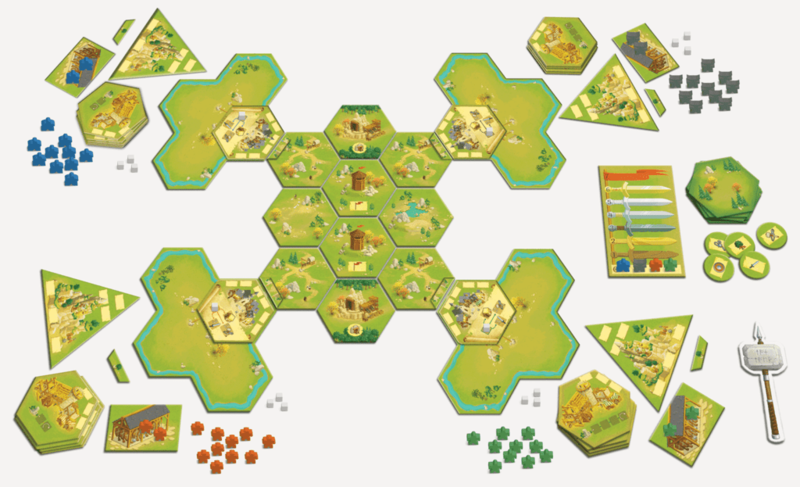 The hex-based map starts symmetrical, but offers advantages (or problems, for some) as the meeples explore it. The “basic actions” would be assembling new meeples (from supply to depot) and deploying meeples (from the depot into the battlefield, in front of your village). The rest of buildings, available after a variable construction time, offer advanced versions of those actions, such as deploying on hex spaces you control or deploying next to an enemy, or completely different actions, like moving enemy meeples or bombarding a space killing meeples in it. Exploring is straightforward, meeples move 1 space during their turn, and they can move into unexplored spaces, revealing them. They can have different effects, such as a workshop that assembles a meeple if you start your turn with 2 meeples there, the ability to cross forests (an element on the hex spaces that usually blocks movement) or the ability to travel from a space with a mine to another space with a mine. Combat is simple: each attacker kills a defender, each defender kills an attacker. Attackers get twice as many battle points, and with 7 battle points you get one of the 6 victory points needed to win the game. Attacking buildings is equally simple, have one of your meeples walk into a building, and they will stay in one of the 2-6 spaces on it. When all spaces are full, you get as many points as meeples attacked (do note they cannot be used as regular army then!). Getting to 6 points, then will be a mix of destroyed buildings, killed meeples and one or two capturable towers in the middle of the battlefield or the explorable areas. Meeple War is a wildly different experience as 2-player or 4-player, and as such giving it a rating for both at the same time was hard. Ultimately I went with “is the game fun?” and yes, it is, hence the 4. The main problem is, I believe, balance; primarily for 2-player matches. Both the exploration tile effects and building time/actions can severely impact the outcome of the match; the first based on luck, the second on strategical choice – but a one-turn mistake in building order can cost you the match. In a 4-player match, the other players act as a balancing force, they are in here to win, too, and they will not let someone get away from crushing someone else – otherwise they lose. But in a 2-player match there it is just a one on one, and there is no one else there to “save the underdog”. But, as a 4-player match, it is a fun experience that forces interaction with all players and does not suffer as the 2-player experience. Quick, uncomplicated combat: No dice rolling or learning special rules, it’s an eye for an eye affair. Exploration randomness: while it is fun and offers more replayability, some of the tiles are more powerful (altars, 2 VP-towers) and can tilt the balance purely based on luck. There is a fair amount of actions and hex tile abilities to learn for new players, which can be daunting. Once all players are familiar with all actions, there is still a good degree of tactical choice, but without needing to read the Art of War. I certainly love the name “Meeple War”! The box art is also great but the board looks pretty uninteresting.I enjoy a good simple war game but that “luck of the exploration” tile draw is really not my cup of tea. These exploration type mechanics (like Eclipse) really bug me… and yet they are thematic, if it’s unexplored you never know what you might find. Unless every tile is balanced against every other tile, and no random synergies can come up, (in which case you lose the excitement) someone is going to get an unfair advantage.